Supertramp Indelibly Stamped Sealed with Promo sticker. The album cover is quite nice. The top right corner the factory or distributor cut the corner shrink and adhered the Promo sticker. The shrink is missing from that corner as shown in photo's. Unless specified these albums have been used and will show wear from handling and use. We'll try to provide you with enough pictures so that you'll be able to make your buying decision. Supertramp ~ 1980 A&M Records. NM (Near Mint) The vinyl and/or the label have one or two slight flaws. EX (Excellent) The vinyl has nearly all of it's original gloss but may have a couple of light surface scuffs or scratches. 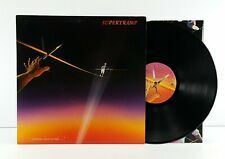 Famous Last Words By Supertramp (Vinyl 1982 A&M) Used LP 33 Original Album. Condition is Used. Shipped with USPS Media Mail. 1979 A&M Records ~ SP 3708. NM (Near Mint) The vinyl and/or the label have one or two slight flaws. EX (Excellent) The vinyl has nearly all of it's original gloss but may have a couple of light surface scuffs or scratches. Supertramp ~ 1982 A&M Records 2502. It's Raining Again & Bonnie. NM (Near Mint) The vinyl and/or the label have one or two slight flaws. EX (Excellent) The vinyl has nearly all of it's original gloss but may have a couple of light surface scuffs or scratches. The original inner sleeve has splits. ITS RAINING AGAIN. VERY GOOD CONDITION. Supertramp ‎– Crisis?. What Crisis?. Producer – Ken Scott, Supertramp. Matrix # AMLH-68347-A1 // AMLH-68347-B1 and another issue # AMLH-68347-A2 // AMLH-68347-B1 with RAYS/TRIDENT etching can be found here Crisis?. Laminated 'Sleeve Printed and made in England by MacNeill Press Ltd., London SE1'. Sleeve graded as G as laminate is lifting down left hand front edge, see pictures, includes lyric inner in VG condition, and vinyl is in VG clean condition.